Qdoba Mexican Grill’s Chicken Mango Salad is made with an aromatic tropical salsa filled with mangos, fresh-cut cucumbers and tomatoes, as well as hand-chopped cilantro. The salad is topped with a tangy cilantro-lime vinaigrette dressing that is served over a bed of hand-shredded romaine lettuce and Qdoba’s signature adobo marinated chicken. As with all of Qdoba’s menu items, guests can choose to customize the Chicken Mango Salad to fit their specific taste or diet preferences, such as ordering it as part of Qdoba’s Craft 2™ menu, ordering it naked (without the tortilla bowl) or asking for no sour cream—letting you enjoy a healthy meal on the go, with 27 grams of protein and 5 grams of fiber for less than 400 calories. 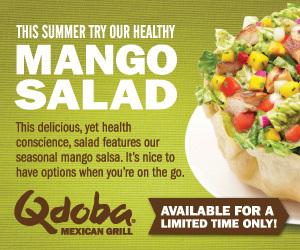 Qdoba’s Chicken Mango Salad is now available nationwide for a limited time. Click here to like Qdoba on Facebook. Click here for a Buy 1 Get 1 Free Coupon for a Qdoba Chicken Mango Salad. WIN: 24/7 MOMS and Qdoba are giving away a Coupon for a fresh Chicken Mango Salad for you and three of your closest friends! 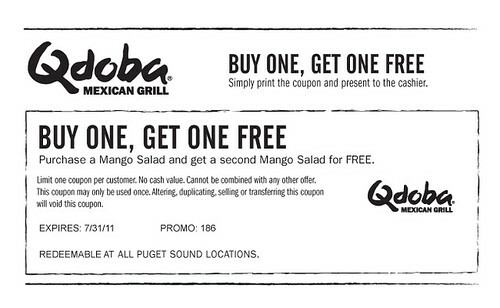 You will receive four free chicken mango salad entrée cards from Qdoba Mexican Grill. US entries only and one entry per person. Winner will be chosen on June 18, 2011. **We received a complimentary Qdoba Mexian Grill's Chicken Mango Salad for review no financial compensation was received. Just subscribed to your site and liked you on FB and Twitter for extra entries to your contest. Looks like a great site to browse some more. Thanks! I subscribed to 24/7. My children are all grown but I have a 6 year-old great-granddaughter and always need ideas on how to be a better "great"
I just signed up for 24/7 Moms. My children are grown, but I have a 6 year-old great-granddaughter and always need new ideas on how to be a better "geat"
I Like 24/7MOMS on fb.